Are you looking for a barrel of fun for the weekend? Not much money? Need a break where you can be yourself and feel perfectly comfortable? If you are in or near southwest Wyoming the Oyster Ridge Music Festival http://www.oysterridgemusicfestival.com/index.html is the place for you beginning Friday, July 26. This weekend marks the 20th year of the festival that swells the host area to nearly twice its population and gives the music lover an opportunity to sample the up-and-comers of bluegrass, folk, blues, country and rock – most of it a mish-mash of many combined styles – musical bliss and it’s free! Early on the going got pretty rough for the free music festival. The little town of Kemmerer, Wyoming is a sleepy haven of coal miners and ranchers speckled with a smattering of public service and government workers; not folks that typically engage in social musical entertainment. I recall driving by the Triangle Park in the late ‘90s, knowing that the music festival was in “high gear” with nary a soul in sight, the lonely band on the stage singing into the empty space. I looked on feeling sad and guilty, sad that yet another local celebration seemed to be dying before my eyes and guilt that I wasn’t contributing with my presence. I returned home after some errands to announce to my husband that we should be in the park supporting the musicians and the community. “Maybe next year.” He said and went on with the work at hand. “There might not BE a next year!” I retorted with some desperation. Lucky for us there was a next year. We spread a large quilt on the grass of the park and positioned the family around to partake of the music. We delighted in the entertainment as we whiled away a Saturday in the summer sun. By evening everyone was up dancing barefoot in front of the bandstand. We went home with dirty feet and singing souls . . . we were hooked. In the following years, we dropped all projects and plans so that we could wallow in the “Oystergrass”. It wasn’t long and we were volunteering, my husband at the beer booth and me at an information booth. When family came to visit we would drag them along drawing them into the musical revelry. Over the years we eagerly awaited ORMF saving back vacation days to fully enjoy the three days of music and merriment in the park – with an extra day off to recover on Monday. We watched as former residents would return for the community celebration, and always delighted in the many friends that gathered together over blankets and beer. I brought Oystergrass to West Virginia with me on a bumper sticker that went the way of the dodo when my car was rear-ended several months ago. (Heidi, I need a new bumper sticker!) I also found a way to reuse those music festival t-shirts that had become ragged around the edges from so much wear – pillows. Leaving behind the people of Kemmerer and especially the Oyster Ridge Music Festival was more difficult than I could have imagined. There is a big blank space in my calendar for this coming weekend, an emptiness that I long to refill. Hopefully next year I can revisit and revive, but until then I will need to get by on the spirit of Oystergrass that I brought in my heart, the friendly spirit that gathering around music can bring. I hope to sprinkle it around the neighborhood a little and watch it grow. My wife and I will fill in for you (at least on the quilt on the grass). We’re heading to ORMF from the Santa Cruz Mountains along the coast of California for our first visit. 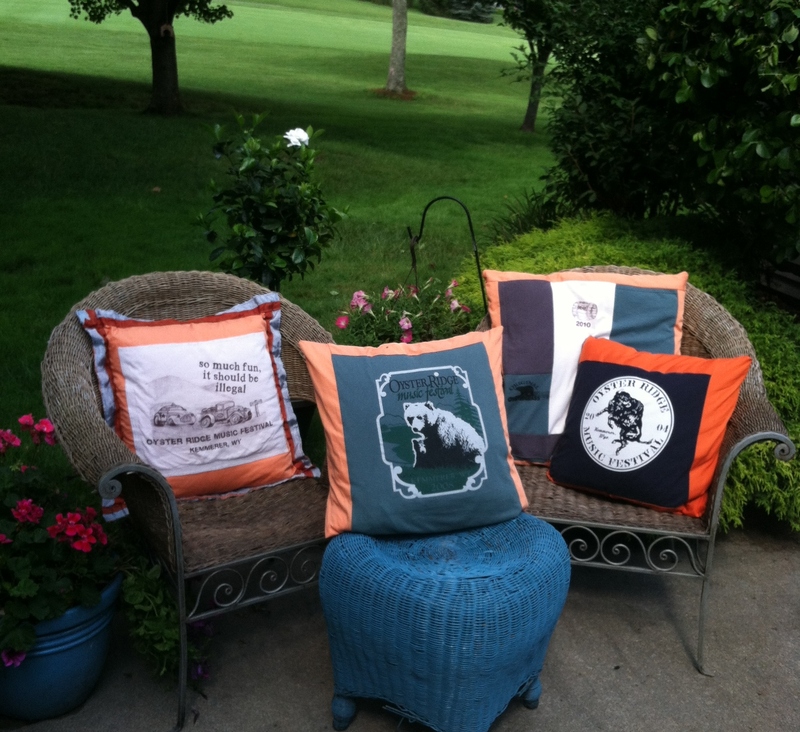 Love the pillows!